Cyrus is a son of BR Moler, the National Champion Bull at the 2005 National Western Stock Show. Cyrus is backed with a dam that was a very successful show heifer for Luke Schroder, CRR. D03 Cotton 356. Cotton has written her own chapter in history. 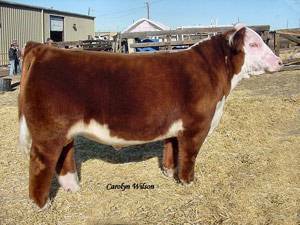 As a calf, she was named calf champion at the National Western Stock Show and went on to be the Grand Champion Polled Heifer at the 2004 Jr. National Hereford Expo, the American Royal and the NAILE. TFR Cyrus should have the rare ability to transmit genetic success at a highly consistent rate in both male and female progeny. More importantly, what excites us the most is the fact that Cyrus is a great bull in his own right that is enhanced even further by his tremendous ancestry.